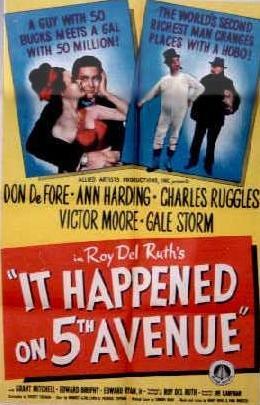 Tag Archives: Alan Hale Jr.
Roy Del Ruth’s It Happened on Fifth Avenue has a small but loyal following. Some people will even tell you that it’s better than It’s a Wonderful Life (1946). They are wrong. It’s a Wonderful Life is the far superior film. But It Happened on Fifth Avenue is still a great picture; warm, human, funny, and perfect for the holiday season. In a plot inspired by the severe housing shortage that followed World War II, Don DeFore plays an ex-serviceman named Jim Bullock (not to be confused with Jim J. Bullock) who’s thrown out of his rented room under protest. (He’s carried out handcuffed to his bed, wearing only his underwear and his hat.) Dejected, Bullock stews while sitting all alone on a bench in Central Park. He’s approached by Aloysius T. McKeever (Victor Moore), who — with his tuxedo, top hat, and little dog — looks like a gonzo version of Rich Uncle Pennybags (a.k.a. “Mr. Monopoly”). McKeever and his little dog live in one of the stateliest mansions on Fifth Avenue, but they enter through the back, because it’s boarded up while its real owner, multimillionaire Michael J. “Mike” O’Connor, winters in West Virginia. McKeever lives lightly off O’Connor’s wealth. The only thing he steals is food from the pantry, and he acts as a responsible caretaker. The only downside is that he has to turn off all the lights and make himself scarce every night when security guards sweep the mansion, but it’s a small price to pay. Bullock settles into McKeever’s way of life quickly, and respects McKeever’s rules, but Bullock can’t help inviting old friends who need housing to join him in the mansion. Eventually, the O’Connors themselves wind up living with McKeever and his big group of friends. The first is the O’Connors’ daughter, Trudy (Gale Storm), who hides the fact that she’s an O’Connor because she likes McKeever’s way of life. Then her father (Charles Ruggles) and her mother (Ann Harding) reluctantly get into the act after their daughter begs them to pass themselves off as destitute people in need of housing. The O’Connors have been estranged for some time, but their bizarre new living arrangement helps them fall in love with each other again. When Mike O’Connor comes home after a long, hard day of shoveling snow for dimes, he can’t resist the smell of his wife’s slumgullion wafting from the kitchen. It takes him back to better days. It Happened on Fifth Avenue is a cute movie. Its message is the same as the message of It’s a Wonderful Life, that no man is poor who has friends, and it also ends with a Christmas miracle. It does it in a more contrived and comedic way than It’s a Wonderful Life, but it’s still a sweet, funny, and very enjoyable movie. Posted in 1947, April 1947 and tagged Alan Hale Jr., Allied Artists Pictures, Ann Harding, Cathy Carter, Charles Ruggles, Comedy, Don DeFore, Dorothea Kent, Edward Brophy, Edward Ryan, Edward Ward, Everett Freeman, Frederick Stephani, Gale Storm, Grant Mitchell, Henry Sharp, Herbert Clyde Lewis, Holiday Films, It Happened on 5th Avenue, It Happened on Fifth Avenue, Joe Kaufmann, Richard V. Heermance, Roy Del Ruth, Roy Del Ruth Productions, Vick Knight, Victor Moore. Bookmark the permalink.